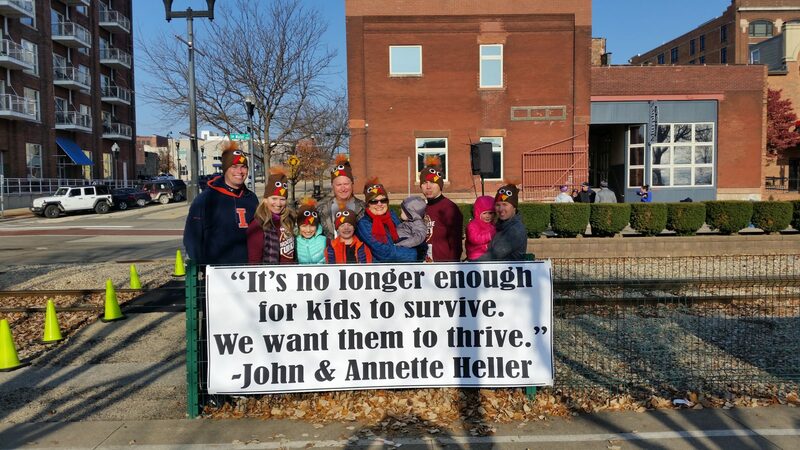 Before chowing down on turkey, 1,700 runners laced up their sneakers to participate in a 3 mile run/1 mile walk to benefit the Heller Center for Kids with Cancer. The race was held at 8 a.m. on Thanksgiving Day. As runners crossed the finish line, each person was given a chocolate turkey to commemorate the experience. Runners from 27 states joined the event – all for the purpose for improving the lives and futures of thousands of local kids and families. Thanks to the passion of 60 volunteers, the participants and sponsors, the event raised an astounding $45,000 to support a comprehensive program that treats the devastating physical and emotional effects of cancer. “The Heller Center for Kids with Cancer will make critical services like counseling, school support and long-term care coordination possible for kids and families who suffer from pediatric cancer. We are beyond grateful to have this level of turnout for the Chocolate Turkey Run and to live in a community that cares so deeply about the children in it” states Tara Boehl, Annual Fund Manager at OSF HealthCare Foundation. You can fund critical services to help pediatric cancer patient’s lead full and happy lives. If you are interested in finding out how you can make the Heller Center for Kids with Cancer at the OSF HealthCare Children’s Hospital of Illinois a reality for families, please click here to download a brochure or contact Theresa Murphy at (309) 566-5663 or Theresa.B.Murphy@osfhealthcare.org. The creation and sustainment of the Heller Center for Kids with Cancer is completely dependent on donations and grants. Join us now so that no child or family in our community faces any of the challenges of cancer alone.